Pet Safety is extremely to all pet owners because of the love they have for their pets. 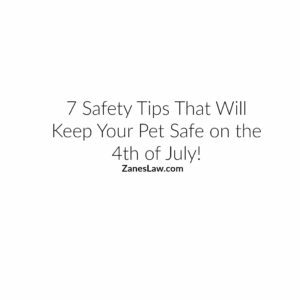 Phoenix injury lawyer Doug Zanes discusses pet safety and provides seven safety tips that will keep your pet safe on the Fourth of July. The Fourth of July is a fantastic holiday. It is full of family and friends, amazing barbecues, fun in the pool, and, let’s not forget, fireworks! Because of everything that will be going on, it is important to consider pet safety before the holiday gets here. But most people don’t realize how scary and stressful this all is to your pets. Everything from the unfamiliar house guests and hot weather to the loud noises can take its toll on our pets. In fact, the American Humane Association says that July 5th is the busiest day of the year for animal shelters because more pets either run away or get lost on the Fourth of July than any other day of the year. Fireworks are the single biggest threat to your pets on the Fourth of July because the loud noise is so frightening to them. To help muffle the loud noises you can turn on your TV or some music. It will also be helpful to take your pets out during the day for lots of exercise because a tired dog is generally a calmer dog. In addition to those tips, the following are seven safety tips that will help to protect your pet. Keep your pet indoors at all times. Even if your pet is used to being outside, you want to keep him inside on July 4th because the panic caused by the fireworks and other loud noises can cause your pet to jump the fence and run away. In line with this, if you are going to a fireworks display or a barbecue, leave your pets at home where it is familiar and safe for them. The loud noises and crowds will be terrifying. Make sure your pets have identification tags and identification “microchips.” This applies to both your cats and your dogs, as well as any other pets (horses, potbelly pigs, etc.) The tag should have up-to-date information. Consider putting your pets in a secure, escape proof room or crate. During either parties and/or fireworks displays this will protect your pet and will ensure that he is not able to run away. Sparklers, glow sticks, fireworks, lighter fluid, and charcoal are toxic to your pets. Your pets may be curious about these things due to their smell, but they can all kill your pet and certainly can make them sick. Too much sun and heat can be dangerous for your pets. Keep them inside if it is really hot or humid and make sure that they have plenty of water available to drink. When your pets are outside, make sure that shade is available to them and make sure that they have access to water. Check your yard for firework debris. After the celebration you want to make sure that there are no used or unused fireworks in your backyard. Even if you didn’t set off fireworks, debris can make it into your yard. This can be harmful to your pets because fireworks may contain arsenic and potassium nitrate, both of which can make your pet sick. Protect your pet from alcoholic beverages. Alcohol is dangerous for your pets. If your pet drinks alcohol he can become dangerously intoxicated, go into a coma, or die from respiratory failure. Yes, even beer is toxic to your pets.